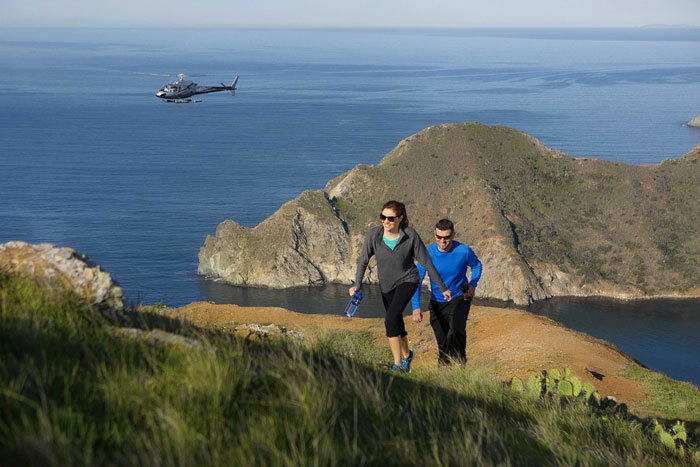 AVALON — Visitors to Catalina Island will soon be able to see the island like never before, with the Santa Catalina Island Co.’s new Catalina Heli Expeditions. The customizable tours can include a variety of combinations of helicopter tours and hiking, biking and/or picnic adventures. Each heli expedition includes transportation from the Pavilion Hotel to Pebbly Beach Heliport. There, visitors will board an Island Express helicopter to begin a narrated sightseeing tour from Avalon Bay to the island’s West End. Hikers taking the heli-hiking trip can choose from two locations — Empire Landing or Ballast Point — where they will select one of two demanding trails. Both challenging in their own right, the Empire Landing route consists of trails and dirt roads, with intermediate ascents and descents before joining an unpaved road leading to Two Harbors. The Ballast Point hike takes hikers from sea level to the ridgeline bordering the community at Two Harbors. Both hikes are approximately two hours in duration and are recommended for advanced hikers. The heli-bike tours begin and end in Two Harbors, and include bike rentals. Visitors are greeted at the Two Harbors Heliport and taken to the Dive and Recreation Center, where they are outfitted with bikes and helmets. Then, they will set off to bike along the unpaved roads that wind along the coastline of Catalina’s West End’s coastline and through the island’s rugged interior. Both packages come with a map, water and snacks. Visitors can also enjoy a meal at the Harbor Reef Restaurant or shop at Two Harbors before being flown back to Avalon. If they prefer to dine outdoors, a backpack-style picnic can be added to their package. The new offering is part of an ongoing $25 million investment SCICo is making in its properties and expeditions, in order to elevate the visitor experience to Catalina Island, Herrel said. Other changes include more nightlife options, more live entertainment, renovations of the Hotel Atwater and vacation casas in Two Harbors, and more new land and sea tours. For more information or to make reservations for Catalina Heli Expeditions, go to visitcatalinaisland.com.